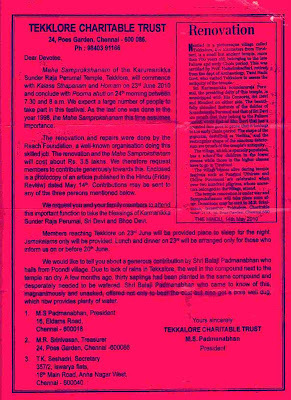 All heritage enthusiasts and Vishnu bakthas are invited for the Vishnu Temple Samprokshanam (Kumbabhishekam) Consecration ceremony to be conducted on 24th of June 2010. The invitation is here for you all to see. This place is about 12 kilometres from Tiruttani bus stand. REACH renovated this temple in record 30 days with a budget of just 1.60 lakhs. The committee is celebrating and also adding for for Corpus to maintain the temple and do nithya poojas for another 1.5 lakhs. Members may see the invitation for the details and do the needful.